Synalar is used in the treatment of certain skin conditions such as eczema, dermatitis and psoriasis. It contains fluocinolone acetonide, an ingredient which reduces inflammation and is a steroid. 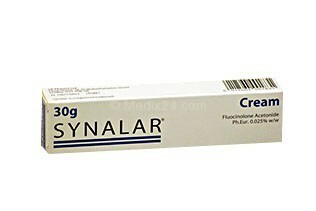 Synalar is not used to treat large areas of psoriasis, because the side effects may be greater. Used for treating: eczema, dermatitis and psoriasis. Effect: reduces inflammation and battles itchy, allergic skin conditions. Available in: cream, ointment and gel.